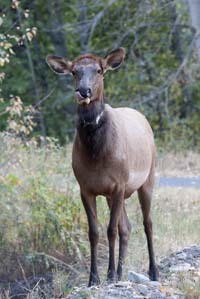 With winter just around the corner, a wildlife official said the number of elk feeding sites in the Wood River Valley has been diminishing over the past few years. The Elkhorn feed site used to be near the Community School’s Sagewillow barn, maintained by the Wood River Elk Trust. That site was shut down in 2007, when the Sagewillow Homeowners Association sued the Community School and elk feeder Ed Dumke, claiming that the practice was “socially and environmentally unsound.” The practice had started in the late 1970s or early 1980s, but ended that year. Despite an attempted resurgence in 2008 and 2009, the practice has ended. Berkley said that, unfortunately, the elk still don’t seem to have gotten the message. There has been no decline in the number of elk that show up at the Sagewillow Barn in the winter, she said, and she expects this year to be no different. Berkley said elk are also active in Gimlet, where some residents reported to the Idaho Mountain Express that a neighbor had installed a salt lick in a backyard. “Elk occur naturally in Gimlet every year,” she said, adding that it’s not unheard of for residents to put salt licks in backyards because they like to see the elk herds. And that’s a problem, she said, as it results in damage to landscaping and increases the likelihood of elk-human conflicts—such as car accidents, especially in those sites near state Highway 75. Berkley said the major sites remaining are one south of Bellevue and one out Timber Gulch south of East Fork Road. Both sites started as places where 60 elk would congregate. Now, she said, each has more in the neighborhood of 200 animals. Berkley said the Idaho Department of Fish and Game discourages elk feeding, mostly because it prevents natural migration, can draw predators and can foster disease. However, the agency seems to be making progress in that area. In addition to the sites shut down in Elkhorn and Warm Springs, Berkley said, she believes that the Golden Eagle Homeowners Association, which normally puts a feed site out Timber Gulch south of East Fork Road, voted this year not to feed the herds. A call to the Golden Eagle Homeowners Association board to confirm that was not returned to the Idaho Mountain Express as of press deadline Tuesday.